I've been planning my next hundred couple projects even though a have a few (only 5) projects on the needles already. I have found a hundred few new projects that really excite me and I am ... ahem, sorry, I seem to have a bad case of queue-itis (it is so a word) right now. Apparently, I am not one to have my queue set in stone. I would think that I would be a seasonal knitter. Coming into the summer months I am trying to look at smaller projects, like socks and mittens, but my attention keeps coming back to the sweaters. The voice in my head whispers that I could quite realistically have one or maybe two of the items on my queue done before fall. I am trying to be assertive when I tell her to shut up and to focus on our current WIP but still my eyes wander. If I want to have my knitting priorities to be set in stone I had REALLY better stop looking at new knitting publications and on Ravelry. 1. Pont Neuf, design by Emily Wessel and found in Twist Collective Spring/Summer 2013. I LOVE this sweater!! I am not usually one to choose such a fitted and feminine sweater (never mind the buttons, eek) but this one is gorgeous. You had me at the lace front panel and my heart was stuck at the 3/4 length sleeves. I love the cheeky and peek lace. 2. Robin, design by Josee Paquin, published in UandIKnit and downloadable on Ravelry . This is much more my style. I could wear this with everything I own! It is a loose fitting and comfortable sweatshirt style sweater with details that allow you to hint at some shape underneath. I love the ballet neckline and the scoop in the back that will cover my bottom. I am also really drawn to stripes right now. 3. 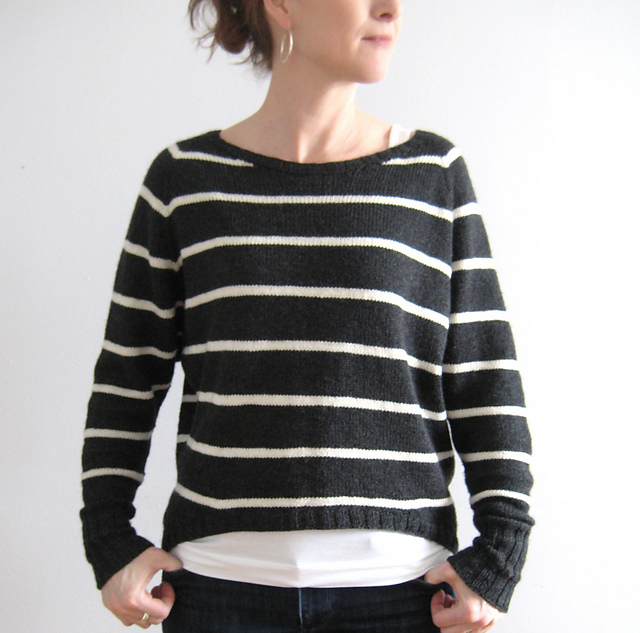 Humbolt Raglan, design by Alexandra Virgiel and found in Knitscene Spring 2013﻿. Again much more my style. This is a simple sweater with a lovely lace detailing on the front that allows for that flirty peek of lace camisole beneath. I have bought the yarn already for this one already as it immediately jumped to the head of my queue right after I bought this magazine. I bought Berroco Vintage, DK, in a hot pink. 4. 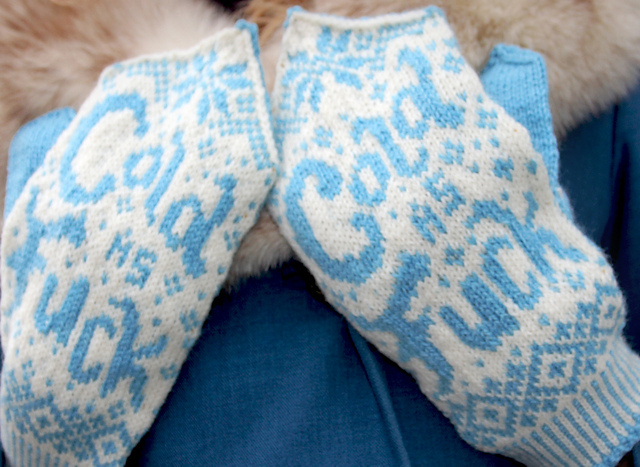 Maybe this will be the next Birthday Mitten for my sister. These are the How Cold Is It? mittens, designed by Drunk Girl Designs and available on Ravelry and on here on Etsy.com. These are fabulous, hilarious, and crude. Just like me... and my sister. So perfect all around. What's in your queue right now? Are you a seasonal knitter? 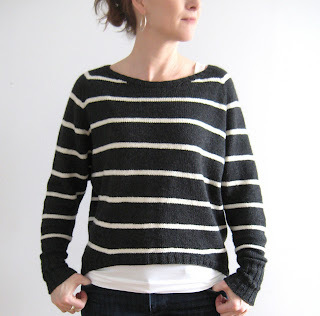 Labels: Process knitting dilemas, queue-itis, What's on my mind today?